Kids who can't tolerate gluten need not sit out when it comes to Easter treats. There are plenty of holiday desserts that are free from gluten but are just as tasty as their gluten-containing counterparts. Be sure to check labels and confirm the ingredients and products you are using in these recipes is indeed gluten-free. Be especially cautious when purchasing candy, baking chips, and food coloring. 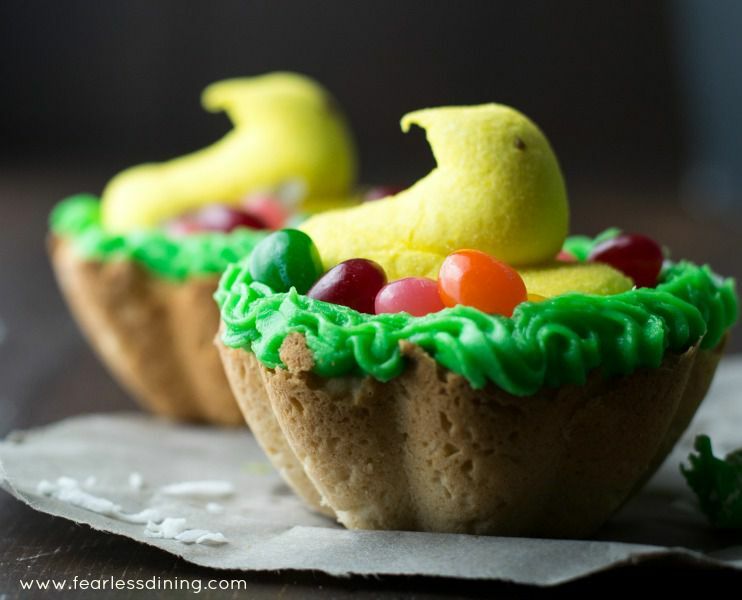 These gluten-free lemon cookie nests are a delicious treat to make for your Easter celebration, especially if you love to bake and create! These festive Easter cupcakes are made with coconut and almond flour for a dessert with amazing texture adults will appreciate and toppings kids will love. Crisp meringue nests filled with a delicious vanilla cream filling and piled high with sweet berries and dark chocolate shavings. Fun and festive French macarons with an Easter twist. These Easter Bunny Macarons are sure to impress both adults and kids alike. Marbleized Chocolate Bark is like finger painting in the kitchen, but you get something delicious to eat when it’s all done! These delectable Scottish Gluten-Free Empire Biscuits are tasty little shortbread cookies sandwiched together with jam and iced on the top. Made with coconut, lemon, raspberries and a few other simple ingredients, these cookie cups have a subtle hint of pink color and are perfect for Easter, special events, birthdays and more. With how moist and fluffy they are, you’d never know these carrot cupcakes are gluten-free. This is not a “sub in for gluten carrot cakes, but not quite as good” cupcake – no, this cupcake is delicious in its own right! Crisp and chewy French Macarons sandwiched together with your choice of fruity Cheesecake filling. Lemon, strawberry, and blueberry cheesecake flavors offer colorful fillings that are perfect for Easter. These raw, vegan cacao coconut cashew balls are a delicious naturally sweet dessert not just for Easter, but any occasion. A nostalgic, no-cook chocolate treat that takes less than 10 minutes to prepare. Coconut Lemon Macaroon nests are easy and fun to make, a perfect treat for spring and Easter. These gluten-free carrot cake donuts are made in one bowl and naturally sweetened, finished off with a fluffy coconut cream frosting for a dreamy Easter breakfast treat.